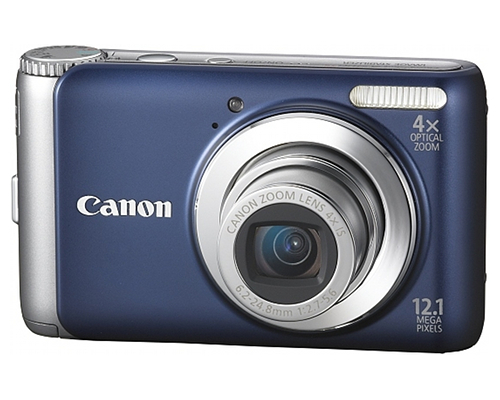 The Canon PowerShot A3100 IS is a consumer point and shoot digicam offering a 12.1 megapixel resolution and a 4x optical zoom in order to make taking high-resolution, detailed photos relatively easy. The PowerShot A3100 IS measures 3.83" by 2.29" by 1.11" and weighs approximately 5.47 with its batteries and memory card installed, making it comparable to many other models in its compact size and lightweight formfactor. The camera has a total pixel size of approximately 12.4 megapixels and 12.1 effective megapixels within that. Its focal length is between 6.2 (W) and 24.8 (T) mm, equivalent to 35-140mm in a 35mm film camera. It includes a 4x digital zoom and has a focus range of 1.2" to infinity (W) and 12" to infinity (T). When in macro, its range is 1.2" to 2' (W) and 12" to 2 (T), and it includes a TTL autofocus system. The camera has a maximum aperture of f/2.7 (W) to f/5.6 (T) and shutter speeds of 1 - 1/1600 sec and 15 - 1/1600 sec. In Long Shutter mode, speeds of 15, 13, 10, 8 ,6, 5, 4, 3.2, 2.5, 2, 1.6, 1.3, and 1 second are available. The camera includes a 2.7" TFT color LCD with approximately 100% coverage and 230000 dots. It does not include an optical viewfinder. Playback modes include Easy, Auto Rotate, Resume Playback, Image Advance, Rotate, Favorites, My Category, Jump, Slide Show, Magnification, Index, Trimming, Resize, Focus Check, Historgram, Overexposure Warning for still images. Movies can be edited on-camera. The camera's sensitivity is configured automatically and offered at ISO 80/100/200/400/800/1600 equivalents. The camera controls exposure via AE lock and compensates for overexposure by moving in +/- 2 stops in 1/3-stop increments. The camera includes white balance control settings for Daylight, Cloudy, Tungsten, Fluorescent, Fluorescent H, and custom options. The built-in flash offers automatic settings but also red-eye reduction, auto red-eye correction, flash on, flash off and FE lock, slow synchro, and smart flash options. The flash range is between 12" and 6.6' (W) and 12" - 13' (T). The flash can recycle in 10 seconds or less. Shooting modes include P, Automatic detection of shooting scenes, Easy, Portrait, Landscape, Night Snapshop, Kids & Pets, Indoor, SCN (offering Face Detection Self-Timing, Low Light, Super Vivid, Poster Effect, Beach, Foliage, Snow, Fireworks, and Long Shutter settings), and Movie. Photo effects include Colors Off, Vivid, Neutral, Sepia, Black & White, and Custom adjustment. The camera can shoot .8 shots a second (2.6 shots a second in Low Light), offers a 0-10 second self-timer, and no wireless controls. The camera includes a USB 2.0 port and support for SD/SDHC/SDXC Memory Cards, MultiMediaCard, MMC Plus, and HC MMC Plus Cards. JPEG Compression options include JPEG, AVI (with monaural WAVE audio), and resolutions between 640 by 480 and 4000 by 3000 depending on the camera's settings and how they are configured. The camera includes a battery pack and an AC adapter kit for charging. It can produce approximately 240 shots or 6 hours of playback before requiring a recharge. Support for AA batteries is unavailable if needed, as the package is too compact to support them. Users traveling and needing to regularly produce photos will likely be using an SLR or a more sophisticated camera system than a point and shoot, however. The camera cannot shoot HD video like some newer low-cost cameras can. Some users report that indoor shots with the camera can be difficult to produce using the automatic settings without yielding unpleasant flash artifacts and blurring, making it difficult to use as a point and shoot camera. Additionally, in outdoor settings, the lack of a viewfinder can be a nuisance, as the LCD can be extremely difficult to see in direct sunlight. The camera has a limited selection of accessories because it is a point and shoot digicam. Canon advertises a deluxe soft case, additional battery packs, battery chargers, and an optional high-power flash. However, additional lenses and filters, as are available on higher-end systems, are unavailable on this camera.